2. Allows easy vertical movement for the best viewing comfort. 3. Features a modern look with DVD Player stand. 4. The optimal viewing comfort can easily be achieved thanks to the height-adjustable function. 5. It also offers flexibility for the application: conference use, home entertainment, exhibitions, etc. 1. Weight capacity: ~50kg (110 lbs). 2. Screen size: 32"~ 52". 4. Mounting option: ultra mobile TV cart. 6. 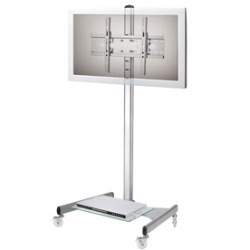 TV adjustable height: 1200 ~1600mm. 7. Display compatibility: mounting holes fit within horizontal: 100~600mm Vertical: 100~400mm.